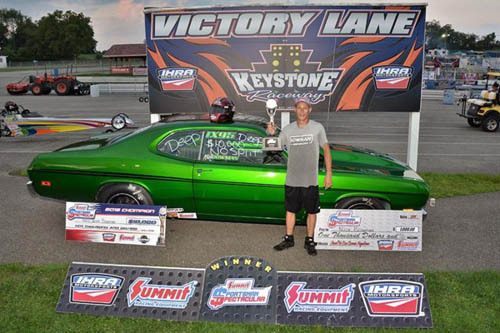 NEW ALEXANDRIA, Pa. -- Nick Bowman and Mitch Shomber scored key wins in the International Hot Rod Association (IHRA) Summit Spectacular races at Keystone Raceway Park. Bowman became the first No Box racer to win an IHRA Summit Sportsman Spectacular race on Moser Engineering $10K Saturday. He doubled up with the $10,000-to-win race and earning a $1,000 bonus as the final No Box racer. Mitch Shomber had a near perfect run including a perfect light to edge Steve Marinchek for the victory in Sunday's race. In Saturday's final, Bowman from Export, Pa., was .03 slower than Andy Conrath from Pleasant Unity, Pa., at the tree, but Conrath broke out by .006 on his dial-in, while Bowman went 6.789 on a 6.78 dial-in. Bowman had earlier taken the No Box win with a .012 reaction time and a 6.783 against a 6.79 dial-in. Runner-up Jeff Stewart of Fairmont, W.Va., was slightly slower .014 at the start and ran a 7.259 against a 7.27 dial-in. In the Junior Dragster 7-11 category, Jake Harvanek from Cheswick, Pa., matched his 8.94 dial-in to overcome Nicholas Abruzzi from Warren, Ohio. Abruzzi had the better reaction time .052 to .153 for Harvanek. Grace Rowe from Marengo, Ohio captured the Junior Dragster 12-17 victory with a .063 reaction time and a 7.915 elapsed time. Kyle Beno from LaGrange, Ohio finished with .079 reaction time and a 7.932 elapsed time. In Sunday's $5,000-to-win race, Shomber from Philo, Ohio had a perfect light (.000) and then paired it with a 5.129 elapsed time at 131.27 mph against a 5.12 dial-in. Marinchek from Mt. Pleasant, Pa., was solid with a .015 reaction time, and then posted a 5.009 elapsed time at 136.99 mph against a 5.01 dial-in. The final margin of victory was a scant .004 of a second.